At CES 2019, myCharge showcased a robust assortment of portable charging solutions of all shapes and sizes. 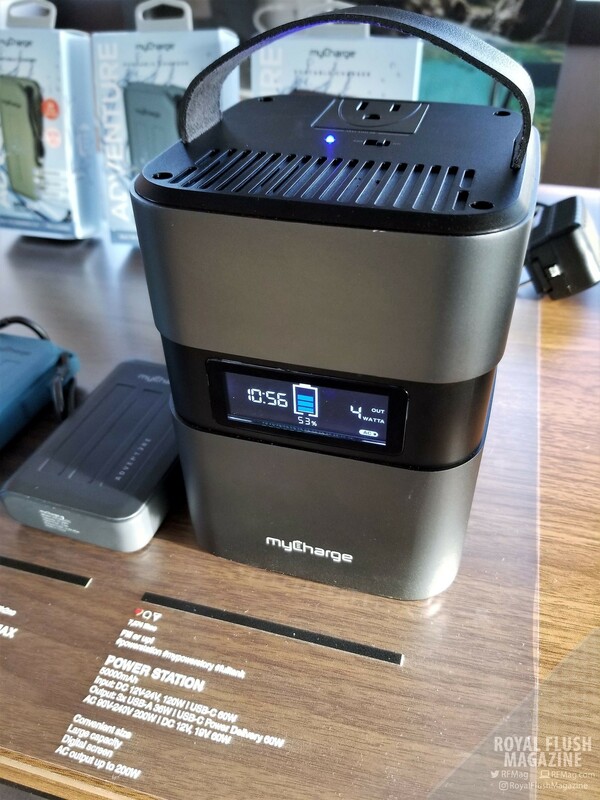 We have been keeping our eye on myCharge for some time now, and we simply loved the myCharge HubPlus C we reviewed this past summer. Since then, myCharge’s product line has grown exponentially. Whether you are looking for wireless chargers, fast chargers, compact chargers or simply big ol’ batteries, myCharge has you covered in practically every charge style and need. As their product lines were seemingly endless, here are some of the products that stood out the most to us. Starting with an incremental addition to their flagship line, the myCharge Hub Series now has a product that combines lightning and USB-C cabling. Previous iterations featured a micro-USB and lightning combo or a micro-USB and USB-C combo, like the HubPlus C mentioned above. Now the new HubMax gives you the fastest wired mobile charging options available in one neat 10,050 mAh package. Just like its Hub series brethren, the HubMax will also feature stowable outlet prongs and a USB-A port for plugging in all kinds of devices to charge. 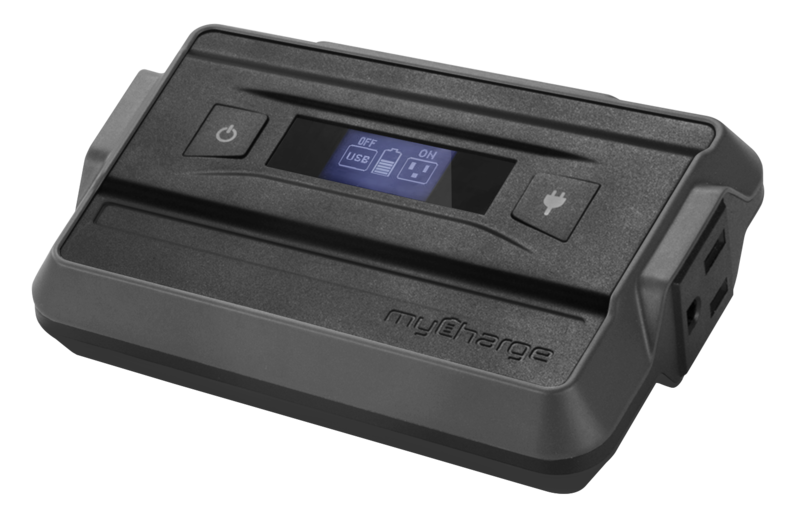 Just because myCharge has numerous solutions focused on delivering high output rates, it does not mean that they cannot go wireless. The myCharge Unplugged Series comes with quite a bit of options in this collection alone, all of which are Qi certified. For the home, you have the power source-tethered Wireless Pad Lux, Wireless Pad Slim, Power Disk+, and the Wireless Stand. The Wireless Pad Lux and Wireless Pad Slim lay flat on surfaces, giving your device a place to rest on while it charges. The Power Disk+ works the same way while being capable of delivering the largest wireless charge rates that mobile devices can handle. The Wireless Stand gives you two resting arrangements for your device, flat and upright. Now, since it is myCharge we are talking about here, you would have to imagine that there would be portable options. The Unplugged Series also offers Unplugged power banks in 3000mAh, 5000mAh, 8000mAh, and 10000mAh options, with a second 10,000mAh option in the Unplugged 10K Dual. Each option features the ability to wirelessly charge Qi-enabled devices on the face of the power bank, while also housing USB-A ports for miscellaneous wired charging needs. The Unplugged 10 Dual is the Unplugged 10K but with a second charging coil, making it wirelessly chargeable, itself. Now you can have your device wirelessly charging on the Unplugged 10 Dual while the power bank itself is receiving a wireless charge. 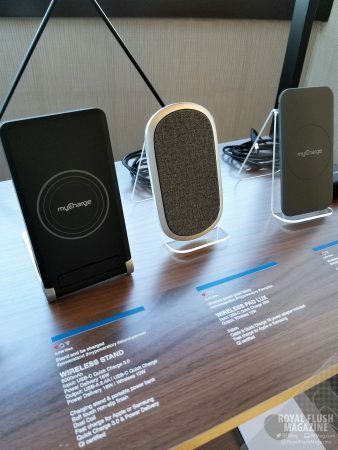 Not stopping there with the portable options, myCharge is also bringing forth multiple device charging into the mix. 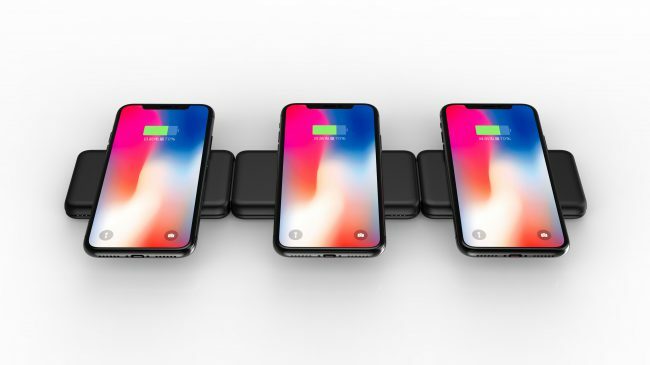 The PowerFold expands out to reveal three wireless 10W charging pads, capable of fast charging. The Power Chain is a set of three wireless charging powerbanks that can daisy chain to share one outlet power source. The myCharge Razor Series of products feature a signature aluminum finish and have a wide range of capacity offerings, going from 8,000mAh up to 20,100 mAh. These latest products extend the options even further, specifically in the power input and output departments. The Razor Mega-C is a 20,100 mAh power bank that will charge itself much faster than its predecessors using either USB-C Quick Charge or 18W Power Delivery technologies. 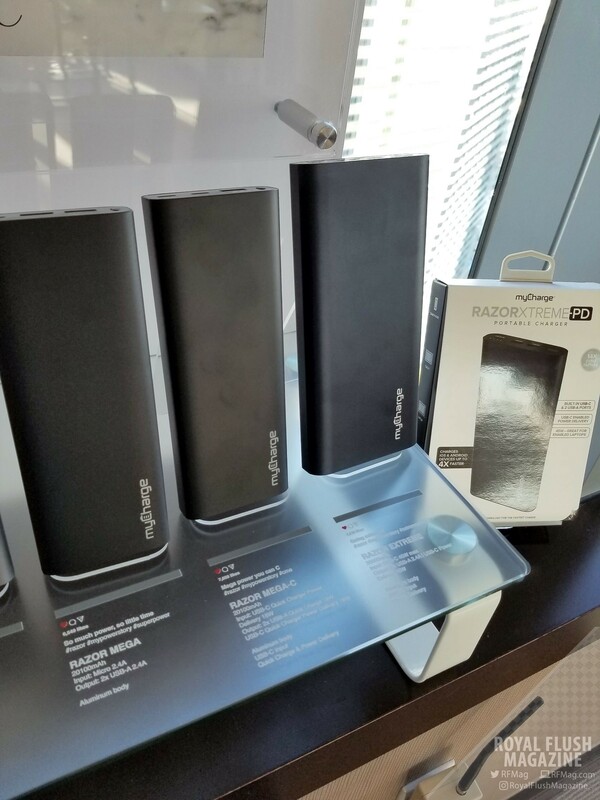 Using these same technologies, the Razor Mega-C will also be able to charge compatible devices at rates up to 18W, challenging speeds faster than traditional chargers or wall outlets. The Razor Xtreme PD takes those charge rates even further, offering up charge rates of up to 45W, targeting even laptop charging. This product line is for those needing portable power banks that can take a licking or two while being able to deal out that much-needed power. These banks feature a rugged exterior to protect from three-meter drops, isolation to protect from extreme temperatures and lids to seal off ports. 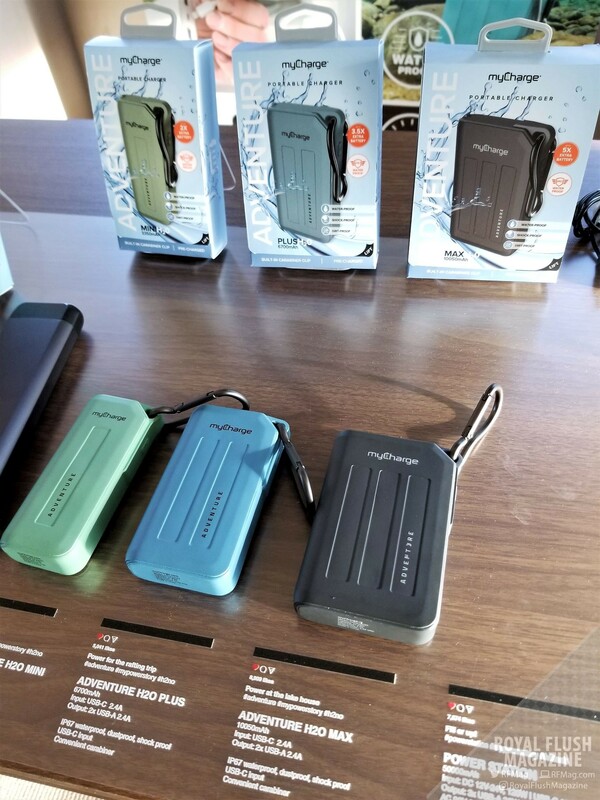 These chargers come in 3350 mAh, 6700mAh and 10050mAh options, with Adventure H20 options coming down the road to offer IP67-rated water protection. Taking these designs even further, the AdventureUltra and Power Station top off the Adventure Series line with the highest power output options. The AdventureUltra is a 13400mAh power bank that can deliver up to 45W of power. This power bank houses two USB-A ports, one USB-C port, and a three-prong outlet for meatier powering tasks. The Power Station sits at the top with a 50000mAh battery, a flashlight, three USB-A ports, a USB-C port and 300w three-prong AC outlet. There will even be options for those of you who need more lighting with their power, thanks to the new Power Lumens. The Power Lumens, coming in 10,000mAh and 20,000mAh, will offer four levels of brightness with six different lighting options.